Most of you know by now that we went to Colorado with the intention of adopting one burro and ended up coming home with two. Thank goodness Don – the best husband in the world – was there to keep me focused. We walked into the pen with the jacks. As we walked around that pen, it was like ripples on a pond. As we moved, the jacks moved away from us. Except for one, who moved toward us. Burro number 2493; now known as Fergus. I remember thinking how soft and fluid his eyes were – they were so doe-like, so beautiful. He walked up to Don and lipped Don’s fingers, and then did the same to me. Don and I looked at each other in amazement. 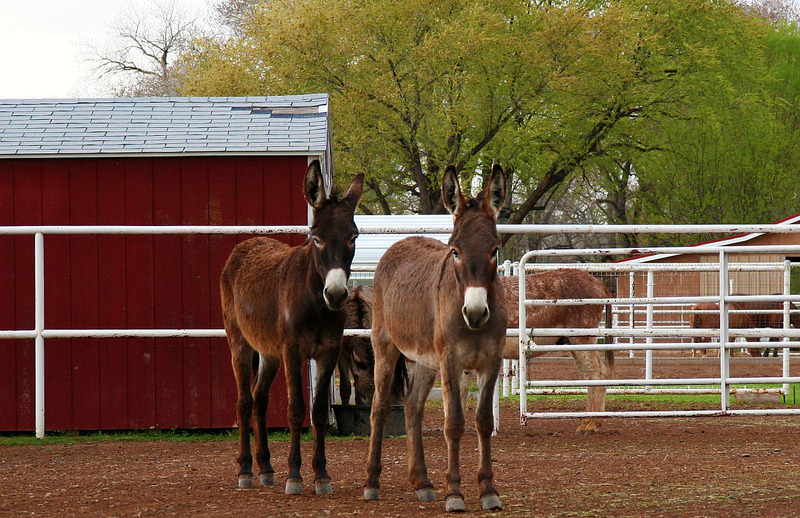 But wait, there was another burro. While all of the other jacks continued to hang back, this guy was ever trying to summon up the courage to move closer. It was as if he wanted or needed to stay close to Fergus. He was burro number 2492; now known as Nigel. The strong bond between them was obvious and we couldn’t stand the thought of breaking it. This means that they’ve most likely been with each other all their lives. It’s even possible that they’re siblings. According to the BLM, Fergus is two years old and Nigel is three. The area in which they were captured lies between Fort Irwin Army training center and Death Valley National Park. With summer high temperatures commonly running above 120 degrees F, Death Valley is one of the hottest places on earth. This explains why Fergus and Nigel have such short coats. As we completed a small hill of paperwork and waited for Fergus and Nigel to be loaded into our trailer, we had the opportunity to talk with and observe staff from BLM and the Wild Horse Inmate Program (both paid staff and prisoners, who were working with wild mustangs). Across the board, it was clear that all of these people have a tremendous amount of love and respect for the horses and burros that they work with every day. And their jobs are not easy or without challenge. As we were preparing to leave, I told wonderful Lona from the BLM that I had a pretty good idea that we’d be seeing her again someday. Awww…they chose to go home with you. How wonderful that you were so open and willing to taking them both so they could remain together. It just makes me tear up to think about it. They are two very lucky burros. Give them hugs from Wisconsin, please. I am SO HAPPY you brought both home. Can’t wait to meet them in person! How wonderful for you, Don, Fergus and Nigel! Just curious, is there DNA testing available to find out if they are related? Thank you. Good question! I’ll definitely ask the vet the next time we see him. just a guess but, but is Ellsworth just older, and the others are sitll young ? You’re right… I think that’s a lot of it too. Ellsworth is older (he’s five, Nigel is three, and Bernard and Fergus are two this year). Ellsworth’s hair is also quite different from the other three. It’s very wiry and wavy compared to the others. I would absolutely love to see your donks! I love this story. The thought that Nigel and Fergus could be blood brothers is way cool – can’t wait to hear what Kevin says about the DNA test. Their story brought a tear to my eyes….you are a strong woman to only bring home two. They are lucky boys, so gentle looking, I’m glad I live sooo far away!!! How I long (not so secretly,) for a burro! I wish there were more people that would consider adopting them and fall in love the wonderful souls that they are. I am thinking that your blog and Carson’s, well…. Burros might just stand a chance after all. Glad to see they’re acting like a “herd” ! Much hugs and kisses to the muzzles!!! What a touching story. *sigh* How neat that they actually picked you out and that you were kind enough to take them both. I love stories with happy endings! It’s so great that you were able to take both of them with you. What do Bernard and Ellsworth think of the new arrivals? I can’t wait to chronicle their progress in your family. How sweet they are. Keeping them together was the nicest thing you could have done that day. It says a great deal about you and Don and your love for animals in general Hearts of gold…. hearts of gold. What a great story. I don’t know how you were able to walk away with just two! I would have been torn about the jenny who wanted Don to scratch her ears! It’s so neat that you found out the boys came from the same herd and might even be brothers.